éirígí will be marking the 97th anniversary of the execution of James Connolly, with an event at Arbour Hill on Sunday, May 12. The event will start at 12.3o. Since its foundation in 2006 éirígí has held events at Arbour Hill to mark the execution of Connolly and reaffirm his socialist ideas. “This year also marks the 100th anniversary of the great Dublin Lockout, when Connolly and Larkin led the workers of Dublin in an epic battle against capitalism,” notes the party’s cathaoirleach (chairperson), Brian Leeson. 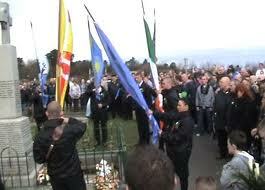 “A century later, socialist republicans are still involved in that same fight in communities across Ireland. “A lot can be learned Connolly’s writings, lessons that are as relevant today as they were at the time of their writing. That is why this year’s commemoration is so important. 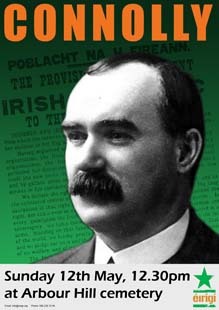 Not only will we honour the sacrifice of our patriot dead, we will also commit ourselves to today’s struggle against the same forces of capitalism which Connolly battled. Tuesday, 30 April 2013, 1:00 p.m.
For information on the EU Military Committee, see here. The socialist republican party éirígí has formally proposed that a series of public debates should take place between its representatives and representatives of Sinn Féin. In a statement, the party has revealed that it put a written proposal advocating a process of public debates to Sinn Féin in recent days. Commenting on recent interaction between the two parties and the éirígí proposal, the party’s Rúnaí Ginearálta/general secretary, Breandán Mac Cionnaith, stated: “Sinn Féin recently invited éirígí to participate in private bi-lateral meetings, with the stated aim of developing ‘common ground’ and establishing ‘potential areas of agreement’ between the two parties. 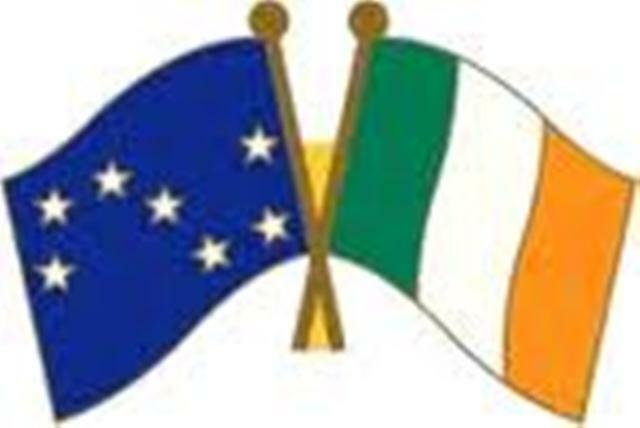 Having fully discussed Sinn Féin’s proposal, éirígí has declined that invitation. Explaining éirígí’s decision to decline private bilateral talks, Mac Cionnaith said: “It is our view that the ideological and strategic distance between éirígí and Sinn Féin is simply too great to permit the development of the sort of ‘common ground’ or ‘areas of agreement’ that Sinn Féin is proposing. I don’t want to run these as separate pieces as it makes it hard for readers to follow the discussion. But I don’t want to respond straight away to Rayner’s piece, because I think it’s a bit unfair to do so. So I’ll leave it up for a few days, before I add my rejoinder. That way people can read and digest Rayner’s points on their merits first. The tone of Philip Ferguson’s reply to this writer is welcome and the answer to it will be made as far as possible in the same spirit, though with rather more stringency as regards the facts. Firstly, to dispose of what Philip describes correctly as being of lesser political importance, the writer is prepared to accept that the attendance at the commemoration was 200 rather than 100, though the smaller figure was supported by others who were there and were, indeed, more favourable to Eirigi than he. What is significant is that the attendance was higher than that last year. The 15th anniversary of the Good Friday Agreement coincidentally coincided with the death of Margaret Thatcher. Given the recent flag riots, the confirmation of Orange supremacy in the streets and the new pan-unionist unity behind Robinson, the complaints of “lack of engagement” from Sinn Fein and watery threats by the British to withhold funds if the local administration does not move beyond sectarian patronage, it is not surprising if there is public discontent. That discontent is buffered by a deep confusion. People are repelled by the actuality of the settlement, yet remain convicted that there is a hidden progressive core that will someday express itself. A similar confusion hangs around the role of Thatcher. Many nationalists believe there were two Thatchers – a bad Thatcher who oppressed the hunger strikers and a good Thatcher who signed the Anglo Irish deal and laid the grounds for the peace process. If we can dispel the confusion about Thatcher’s role we may be able to dispel the broader confusion. Saturday April 13 saw up to 10,000 people take to the streets of Dublin in a march and rally against the new home tax and the wider austerity programme. The event, organised by the Campaign Against Home and Water Taxes, marched from the Garden of Remembrance through Dublin city centre to Dublin Castle, where EU Finance ministers were holding a meeting. 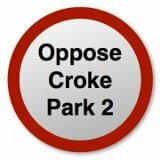 Celebrating the rejection of Croke Park II – but where to now? The rejection of Croke Park 11 is a positive sign that workers are not prepared to just lay down and give up when faced with the Fine Gael/Labour coalition’s attacks on hard-won rights and living conditions and their attempts to make southern Irish workers pay for the financial crisis of Irish banks and the meltdown of the so-called ‘Celtic Tiger’ economy. For several decades the bulk of the union leadership has pushed tripartite deals with the bosses and the state, a ‘partnership’ model which has been held up by union leaderships as far afield as New Zealand as worth emulating. But these tripartite deals did not deliver to workers even during the ‘good times’ of the ‘boom’ periods in the 1990s and early 2000s. Now the boom has inevitably turned to bust, the partnership model has simply locked unions into accepting responsibility for the financial crisis and agreeing to the austerity measures demanded by the Troika. The leadership of the Irish Congress of Trade Unions has engaged in some token rhetoric about ‘sharing the burden’ of the crisis and they have marched workers up and down the hill and then sent them home a couple of times. But, in general, they have acted as faithful lieutenants of the state and capital, serving more to demoralise workers than mobilise them. Over time, the protests against austerity have become smaller and smaller and the main opposition to austerity measures has been the campaign against the household taxes. 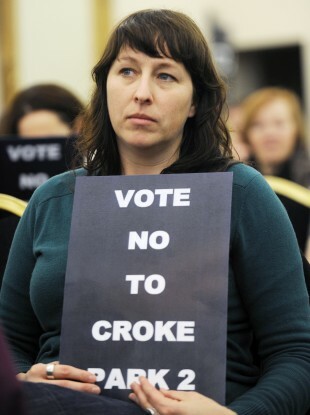 Comments Off on Celebrating the rejection of Croke Park II – but where to now? Cathaoirleach éirígí Brian Leeson has welcomed the trade union rejection of Croke Park II and commended trade union members for their courageous stand against austerity. He has also called on those trade union ‘leaders’ who urged a yes vote to stand down from their positions without delay. Speaking from Dublin, Brian Leeson said, “éirígí welcomes the decision of the trade union movement to reject Croke Park II. This represents a very significant defeat for the failed policies of austerity that are being pursued by Fine Gael, Labour and their Troika masters.